Congratulations to Cary Medical Center’s and Pines Health Services 2018 New Year’s Baby, Andrew, and his Mom, Nelita Martin of Presque Isle. Andrew was born on Tuesday, January 2nd, at 3:36 pm, weighing 8 lbs, 13.4 oz. and measuring 22 inches long. He was delivered by Certified Nurse Midwife Bonnie Bouchard with Pines Health Services Center for Women’s and Children’s Health. 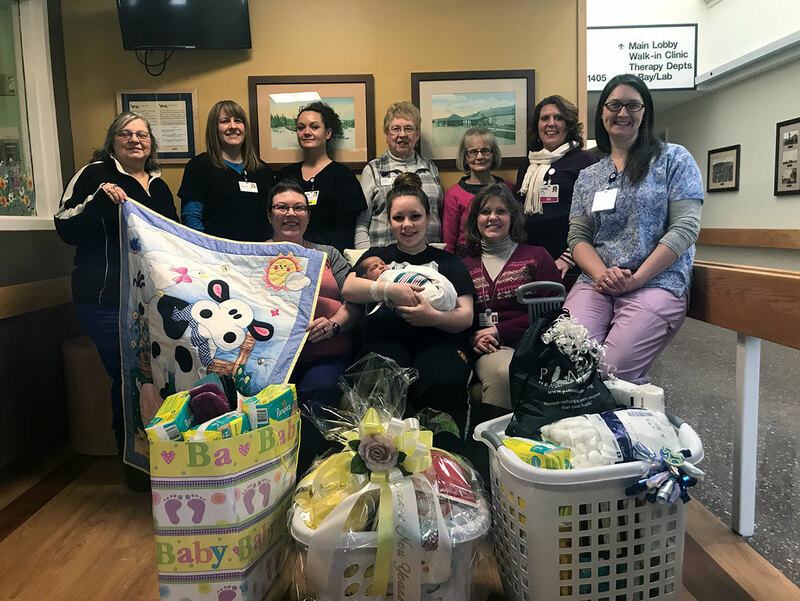 Nelita received gifts from the Cary Medical Center Ladies Auxiliary, the hospital, and a beautiful handmade quilt from the Crown of Maine Quilters. With Andrew and Mom, are standing, (l-r) Judith-Green Tarr from the Crown of Maine Quilters; Sharon Parent, Pines Women’s and Children’s Medical Assistant; Elsa Collins, CNA; Mariel Thomas and April Caron from the Cary Ladies Auxiliary; Jennifer Plante, RN, Maternal/Child Primary Charge Nurse; and Courtney Bossie, RN. Seated with Nelita and Andrew are (l-r), Casey Harpine, RN, Nelita’s labor and delivery nurse; and Bonnie Bouchard, CNM, who delivered Andrew.